The largest wedding fair yet, featuring the renowned KL-PJ Top 30 Local Bridal Houses from SS2, Sunway, Damansara, Puchong, Jalan Ipoh, Loke Yew and Cheras. 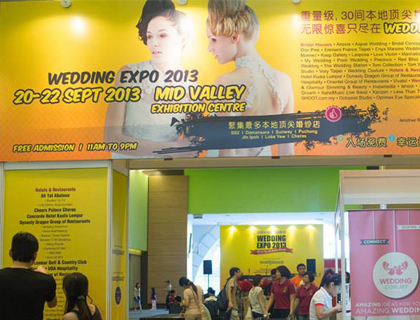 KL-PJ Wedding Fair 2014 will bring together Malaysia’s largest gathering of local bridal houses, studios and celebrity wedding photographers including Enya Mareine, Keep Gallery, Artiz Studio Korea, Touch Group, Tom Group, etc. Also incorporating Wedding Venue, Banquet and Restaurants Show (WVB&RS) and Beautiful Brides Show (BEAUBS). BEAU.BS – All under one roof, exhibitors include Malaysia’s best spas, beauty and slimming salon, wedding gowns and dresses, shoes, jewellery, wedding planner, live band, cake makers, stationers and more! KL-PJ Wedding Fair 2013 has everything you need to plan for a truly unique wedding day and to make you the super-beautiful bride of the day!